NEW YORK (CNS) — Strong humane values permeate director Craig Gillespie’s breezy baseball-themed conversion story “Million Dollar Arm” (Disney). So it’s a shame that some relatively discreet but still misguided sexual content precludes endorsement of the film for youthful viewers — all the more so, since screenwriter Tom McCarthy shows unusual restraint in his use of objectionable language. 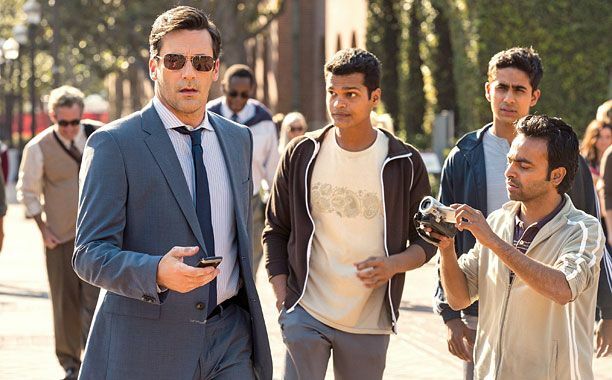 McCarthy’s fact-based script introduces us to down-on-his-luck Los Angeles sports agent JB Bernstein (Jon Hamm). Facing bankruptcy after their bid to sign a major NFL star (Rey Maualuga) falls through, JB and his India-bred partner Ash (Aasif Mandvi) are desperate to find an alternative moneymaker. Partly inspired by Ash’s love for the game of cricket, JB hits on the scheme of traveling to his colleague’s homeland and staging an “American Idol”-type reality show in which cricket bowlers will try their skills at pitching. The two players who come out on top in the competition, JB announces, will receive not only a cash prize but the opportunity to travel to the States and train for a major-league tryout. Despite some culture shock on both sides of the divide, and despite the comic eccentricities of Ray Poitevint (Alan Arkin), the retired scout Ash hires to help judge the contest, JB’s plan succeeds. And he acquires the volunteer services of local baseball enthusiast Amit (the single-named Pitobash) along the way. But personal challenges arise when JB returns to the Left Coast with victors Rinku (Suraj Sharma) and Dinesh (Madhur Mittal) in tow. Since both were raised in remote rural villages, they find life in urban America utterly bewildering. Though slightly more sophisticated, Amit, who has also made the journey to California to serve as the lads’ coach, is almost equally at sea. Thus begins JB’s transformation from callous, business-obsessed loner to protective mentor. JB is also being changed by his warming relationship with Brenda (Lake Bell), the comely tenant who occupies a cottage on his property. JB and Brenda’s romance is marked by premature intimacy. Though this takes place off-screen, a morning-after “walk of shame” for JB is followed up by some banter about the situation among the male characters. Interestingly, all three Indian men take it for granted that JB will now marry Brenda. Though JB shrugs off the idea, it’s clear that the pair does have a future together. To that extent, however flawed JB’s bond with Brenda may be, it too marks something of a moral advance for him. As earlier scenes have shown us, up to now, JB has devoted himself to throwaway liaisons with fashion models. Along with learning to place people ahead of profits, JB’s growth also involves becoming more open to religion, though in a way that may leave Christian moviegoers with mixed feelings. Hindu devotions are very much integral to the lives of the two would-be pitchers and their coach. At first, JB wants no part of this, and goes so far as to state flatly, “I don’t pray.” Yet, by the time the picture concludes, we’ve seen him join his friends in prayer — both before a meal and in front of a makeshift shrine they’ve erected. However mature viewers may choose to receive this aspect of the movie, it’s another reason to leave the impressionable at home. The film contains nonmarital situations, an implied premarital encounter, a smattering of sexual humor and some crass language. The Catholic News Service classification is A-III — adults. The Motion Picture Association of America rating is PG — parental guidance suggested. Some material may not be suitable for children.